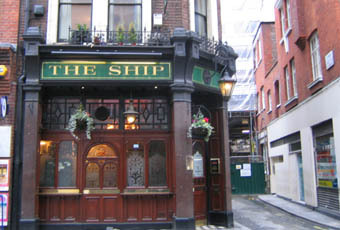 In a bid to visit every pub in London, The Ship becomes my latest adventure. Looks clean enough from the outside and a full selection of the fullers range. The ESB was not in the best condition - which is a crying shame when its over £4 a pint. That said, the Who's greatest hits playing just loudly enough to drown out the loud Americans holding court at the bar made up for it. Slightly. Wouldn't rush back or recommend going out of your way. Sadly now turned into a bland identikit pub with zero personality. R.I.P The Ship. Not the pub it was, always had decent beer & a slightly seedy atmosphere. The Fullers beer remains (good), but it's been cleaned up & the music has become bland. Hark back to the good old days when the Marquee was open & this pub was busy with punters & often the bands themselves. Ah, nostalgia! Like a National Front meeting. Man with a shaved tattoo head talking about football hooliganism - and not from a spectators point of view. My favourite West End haunt without doubt. An admittedly unremarkable beer selection but it more than makes up for that with a welcome, alternative atmosphere and an anti-bland music selection. A refuge against an increasingly gentrified range of cheek by jowl boutique coffee sellers and extortionately priced hair cutters. Long live The Ship.